D. Scott Hildreth, Together on God's Mission: How Southern Baptists Cooperate to Fulfill the Great Commission, (Nashville: B&H Academic, 2018), 112 pp. To those outside the Southern Baptist Convention, the Cooperative Program is probably not a household name, but it is the financial lifeblood of missions in the Southern Baptist Convention. For those not familiar, the Cooperative Program was launched in 1925, and is a unified plan of giving through which cooperating SBC churches give a percentage of their undesignated funds in order to support their respective state convention and the ministries and missions programs of the Southern Baptist Convention. Over the past years there has been a steady and significant decline in SBC Cooperative Program participation. Many have begun to question the mission of the program, and in this book Dr. Hildreth not only give a history of the SBC and the Cooperative Program, he presents the importance of Southern Baptists coming together to re-kindle the power of this amazing program, and shows what all will be lost if we Southern Baptists let this program fade away. These are exciting times for the SBC. While I am personally historically minded and thankful for the many great men who have been part of our convention in the past—especially those of a generation (many of which who are still alive) who fought to bring our convention back from theological liberalism back to the Bible in the mid 20th Century—I am also especially thankful for a new generation of leaders rising up in the Southern Baptist Convention. The SBC is a diverse group of churches, and unlike some other denominations we have far more theological diversity, and there have been theological disagreements within the SBC since it's inception in 1845, however, despite this, for the most part the SBC (both "traditionalists" and Calvinists) always maintained unity and cooperation for the overall mission of taking the gospel to lost people and advancing the Kingdom of King Jesus. Dr. Hildreth points out that "it is naive to believe a body as large as the Southern Baptist Convention will be able to settle a debate that has been raging for hundreds of years. While theological convictions are indeed necessary, it is important for Southern Baptists to seek unity under out common statement of faith and around our common cooperative vision." Often these "theological debates" are about generational power rather than purely on theological issues, and one of the primary things that Dr. Hildreth suggests is that we should discuss cooperation theologically rather than structurally or pragmatically. Moreover, some churches have viewed the Cooperative Program as a "tax" rather than a means of cooperation and Dr. Hildreth argues that we must strive to view the CP as a positive means for advancing the Kingdom. This book is a great resource for getting your head around the Cooperative Program and understanding what challenges are faced currently, and what opportunities there are for growth and expansion in coming years if we Southern Baptists can get our act together and work together. The history of the SBC is built on cooperation, and we must—if we want to continue to reach people for King Jesus—continue to cooperate and take advantage of unique opportunities to work together to take the gospel to the nations. We are called to be a light to the nations, and there is no better way than by working together in unity to fulfill God's Mission! Yesterday, I shared some reasons why you should consider coming to The College at Southeastern for your undergraduate education. Today, I'm not writing only to undergraduates wishing to pursue theological education, but those considering coming to seminary also. Not everyone should come to seminary, and here are three reasons why you should not pursue a theological education (or at least not right now). You are not called by God: This is the primary reason. I was certain I was called by God to come to Southeastern. Had I just wanted to finish my college degree, I could have returned to the institution where I had begun my undergraduate education. It would have been far easier: they have a great evening continuing education program, and it was right in my hometown. But, no, I was certain through prayer and the guidance of the Holy Spirit I was being called to pursue a theologically focused education. Even if you are not called to pursue a seminary or Bible college degree, you can still be an effective minister of the gospel and witness to the world in any career you might pursue. Also, if you are not truly called by God for this type of education, your entire seminary career could be drudgery. If he calls you, he will give to the strength and ability to work through and persevere! You are not enabled by God: Although I felt called to Southeastern, I was a mid-career 30-something who had other life responsibilities. Although it took a bit of faith to disrupt my life and make the move to Wake Forest, NC to begin my education, through prayer and seeing prayers answered I was able to see God working to enable me to make this transition. If a door gets closed, and appears to be locked, do not try to force it open. God is all knowing, and perhaps you are called, but the time simply is not right. God will let you know when to proceed. Above all, pray constantly (1 Thessalonians 5:17). You are not ready to work: I'm not going to sugar coat anything. A theological education will require real work. This isn't Sunday School. You will be reading a lot. You will be writing a lot. You will still most likely have a job. You will have family responsibilities, and church responsibilities. The world does not stop just because you are in seminary. It will be hard. You may want to quit. As much as I enjoy the academic activities of reading and writing, I spent long enough away from structured education to remember what it is like to just not have anything to do. Those times will be rare when you are mid-semester. You will constantly have stuff that needs to be done. Be ready to dig in and work. If you know that you are called, that you are enabled, and that you are ready to work, I will close with three pieces of advice. First, you will have lots to do. Rest is important. This is a great time to grow in your enjoyment of hobbies while working hard at studies. You need to have a balance of work and rest or you will quickly burn out. Second, although you will be in the Word every day, and will be reading lots theological texts, do not let the Bible become a text book. You still must find time to have a worshipful devotional life. Do not become a spiritually starved academic. Make sure you are doing your school work for the glory of God and not just to get a piece of paper to hang on your wall to impress men (1 Corinthians 10:31; Colossians 3:23). Worship God through your schoolwork. Third and finally, ensure you maintain your love for Jesus and your love for the lost people around you. Don't seal yourself up in a seminary bubble where the only people you know, talk to, or are around are people at school and at church. I started college when I was 18 years old; I graduated college when I was 37. After dropping out of college, I went into the I.T. field where I worked for a dozen years and then I felt God calling me to ministry. I wasn't sure what that meant, but I had an insatiable desire to come to Southeastern. Although shortly after feeling the call, I researched a few schools, but I was certain that God wanted me at Southeastern; so I came. I will admit, I was more than a little intimidated. It wasn't a return to an academic environment that intimidated me. I was sure that either through the grace of God or just my own stubborn persistence that the academic part would not be my struggle. Sure, I didn't quite know what to expect, but as a result I worked extra-hard at everything I did. By my second semester, it was old hat, and I'd gotten myself into a rhythm, and I was thriving. The real intimidation for me was the fact that I was going to be a 34 year old college student. I did have some friends who had been to seminary that told me because it was a college at a seminary, there would be older students, so that eased my mind a little. While they were right, I believe at new student orientation, I was one of only a small handfull of students over 20 (but I wasn't the oldest). Once I started classes, I realized that many classes would be cross-listed classes, i.e., I would be in the same classrooms as seminary students. Even so, in most of my core college classes, I was by far the oldest person in the room (and that included some of my professors). What I quickly discovered, however, was that it didn't matter. I developed close friendships with many of the college students. They were struggling in different ways than I was, and it was because I had one thing they just didn't have—more years of experience being alive. I was always encouraged to meet one of my younger friends and hear they nailed a test, or aced a paper. I always tried to be an encouragement to them, and I wanted to be certain I always set a good example of how to manage life and school while being successful at both. So, that is one part of why I am writing today: Even if you are like I was—you think you are too old to come back to college, let me tell you now that you most definitely are not. Now for the second part of why I am writing: why come to The College at Southeastern? The Faculty: If you choose to come to The College at Southeastern, you will be taught by some of the brightest Christian scholars you will find at any school. Some of your professors will be career academics, some will be pastors, but all will be people who serve the local church in myriad roles from members to leaders every week. Every professor I have sat under at C@SE has made a positive difference in my life. The Curriculum: The curriculum at C@SE is a classically based Christian curriculum. There is a core curriculum that includes History, English Composition, Literature, Philosophy, and most importantly four classes of the History of Ideas where you will read and be exposed to thinkers from Plato and Aristotle, to Nietzsche and Freud. The core curriculum will make you a better thinker, a better reader, and a better writer. In addition to the core, all students have a minor in Christian Studies which will include classes in Hermeneutics, New Testament, Old Testament, Church History, Theology, and Evangelism. You'll also take either a Math or a Science and a two-semester block of languages. The best part is, if you are interested in pursuing seminary afterwards, there are several great options. There is a program which will allow you to complete a B.A. and M.Div. in 5 years, or if you want more flexibility in your undergraduate studies, you can complete the regular B.A., and then (like I am doing) pursue an M.Div. with Advanced Standing. This allows you to use many of the classes from your Christian Studies minor (which are almost all cross-listed with Seminary students) and apply them toward your M.Div. core. This not only makes your M.Div. a little shorter over-all, but allows great flexibility in allowing you to take more advanced electives in your M.Div. you might not have space for in a regular M.Div. The Community: The community at C@SE and SEBTS is fantastic. As a student in the college here, you are not only a part of the college community, you are part of the greater seminary community as well. You will meet, interact with, and make friends with people from many generations and cultural backgrounds. The college has a new House System which fosters even greater community. There are always fun activities organized around campus, college worship events, games, competitions, and other activities scheduled through the semesters. Twice a week the entire on-campus student body gathers to worship together in Binkley Chapel, and you will be able to worship together and sit together under some of the best preachers alive today. Not only that, each year several conferences come to campus, and many scholars come as either visiting scholars, or to give lectures. Not only will you often be able to earn extra credit for attending these extra-curricular events, you will be constantly growing and renewing your mind. There is also the Southeastern Performing Arts Club, and the Center for Faith and Culture which often hosts guest lectures and movie nights. You will be a part of a greater learning community that will give you first-hand access not only to fellow undergraduates, but graduate students, doctoral students, and some of the best Christian scholars in the world. The Campus: The campus at Southeastern is postcard beautiful. The campus was originally home to Wake Forest College. The seminary shared the campus at it's beginnings but took over the entire campus when Wake Forest College moved west to Winston-Salem. Not only the magnificent oaks and beautiful magnolias, there are beautiful buildings packed full of history. The oldest building on campus, Broyhill Hall was built in 1888 and was originally the science laboratory for Wake Forest College. There is no better way to clear your mind by taking a stroll around the quad and simply taking in the beauty of it all. The Ledford Student center was recently remodeled and is always abuzz with activity—from food, to coffee, to ping-pong, to shopping at The Locker you can always find something to do at Ledford. Tools for writing and reading. Most everything I write begins life as ink on paper. While I don't write out entire drafts of long research papers long-hand, I do take notes and make outlines by hand. Although I experimented with one class, for one semester, I never take notes in class electronically. It's always with pen and paper. For me, whether I am reading, preparing a paper or essay, or taking notes in class, there is a connection with having a pen or pencil in my hand and my ability to think more clearly. If I were reading a book and found myself without any sort of marking tool, I would likely end up re-reading that section because I simply will not retain information in the same way. I can read quite quickly, and perhaps the process of marking slows me down; but I believe it's more about the fact I'm actively interacting with the author through my marks. I have a system of little marginalia I use to indicate what's on my mind. I can revisit a book much later and once I see my annotations, I'm right back where I left off. In class, I'm often asked by classmates about my pens, so I thought I would share not only about my pens, but also about pencils, paper and my beloved reading ruler. It's safe to say, at this point, pens are more than a tool for me; they are a hobby. I have quite a few fountain pens, I use all of them often. Below, I will list some of my favorites from inexpensive to more expensive. I have linked to the nibs and colors I own for each of these, however many of these are available in many nibs and colors. All links except for the Nemosine Neutrino go to Goulet Pens which is a family owned business and is where I purchase as much of my pens, paper, and ink as possible. I want to note I am not affiliated with them in any way. I've just always been happy with my service from them, and I love supporting small businesses where I can. 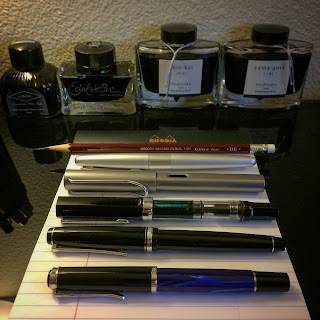 With each pen, I also share the ink I normally use in that particular pen. Platinum Preppy: ($3.95) I actually do not own this pen, but I have given them as gifts. They are a great entry point into a refillable fountain pen. Although a pack of two replacement cartridges cost nearly as much as the pen, Goulet offers these with an "eyedropper mod" allowing you to use bottled ink and an eyedropper to refill these making it even more economical! Pilot Metropolitan: ($15) For most people, either this or a Lamy Safari (mentioned below) is where I suggest to start. They are both great pens, and it really comes down to a matter of style preference. I have a Pilot Metropolitan that originally came with a Fine Nib, but I swapped it out with a Stub Nib later. I normally keep my Metropolitan inked with Pilot Iroshizuku Yama-Guri ink which is a dark brown ink that looks great on cream colored paper like what is in some journals. Nemosine Neutrino: ($24.99) Nemosine pens are a great value, and there is a cheaper option also, the Singularity which has a plastic body and different shape. I'm more hesitant to recommend or gift these as I have had two. One was a total lemon, and I sent it back to the manufacturer who sent me a "hand picked" replacement. I have heard many others say they like these pens and have had good results, but I would recommend buying from somewhere you have the opportunity to return if you are not happy with it, and better yet once you've used a Pilot Metropolitan or Lamy Safari for a while and have some fountain pen basics under your belt. This way you'll be able to tell if something is off with the the pen. I'd hate for a poor performing pen to turn you off to the wonderful experience of writing with a fountain pen! I keep my Neutrino at work (so, it didn't make the photo-op below), and it's usually inked with Diamine Emerald Green which looks and behaves pretty well on the cheap green Steno pads we have around the office. TWISBI ECO: ($28.99) This pen is one of my favorite pens. Unlike the previous pens which are inked either with a replaceable cartridge or from a bottle using a cartridge converter, this pen is what is known as a piston filler. It has a knob that is twisted on the end of the pen that works a piston which is used to fill the entire body of the pen with ink. This pen has a very large ink capacity and is a pen I often take to class with me for note taking. I keep this pen filled with Diamine Sherwood Green which is a darker green than the Emerald Green mentioned above. Lamy Al-Star: ($37.60 or the Safari is the same pen in plastic for $29.60): The Lamy Al-Star and Lamy Safari are twins, except for the material. The Al-Star is aluminum and the Safari is plastic. I have an Al-Star but have gifted Safari's before. Mine is an extra-fine nib, and I like to use it on cheaper paper where a broader nib might feather or bleed through, or if I need to write really small. I usually keep this one inked with the Diamine Sherwood Green mentioned above. Pelikan M205: ($132) This pen is my absolute favorite pen, and will likely remain in that spot until I can afford a gold-nibbed Pelikan (like a M600 or M800). Pelikan pens are very smooth, wet writers that are made impeccably well. Like the TWSBI ECO mentioned above, this one is also a piston filled pen, and has a large ink capacity. I keep this inked with Pelikan Edelstein Topaz ink which is a bright, blue ink. Pilot Falcon: ($152) This pen is my second favorite, and is in a near tie with the Pelikan, but I just like the Pelikan just a little bit better; I can't help it. What makes this pen extra-special is the nib. The nib has a little flex to it which enables some variation in the size of the line, so generally upstrokes are a bit thinner than downstrokes. Now, vintage fountain pens, such as a Waterman 52, had very soft flexible nibs and an amazing amount of line variation. This pen is just a bit softer than a regular nib, but is a fun pen to write with, and if you write slowly and take your time, you can create very beautiful writing with this pen. However, if you write normally with it, it writes like any other pen. I keep this one inked with Pilot Iroshizuku Shin-Kai which is a nice professional blue-black ink. I generally do not write with pencils very often, but I almost always read with a pencil. I find that fountain pens and the cheap paper in most books do not get along, and I have heard that graphite archives very well. I'm not super picky about pencils, but I generally like Mitsubishi HB Pencils. I am also a stickler for neat, straight lines in my books when I'm underscoring words or sentences, and I could not function without my handy-dandy flexible blue ruler. I couldn't find a brand on mine (I've had it a very long time) but I suppose these would be similar in function. It's made of a thick flexible plastic that allows it to flex and conform to curves in books. When using fountain pens, paper becomes more important. Cheaper paper does not always handle fountain pen ink well. I've had okay success with normal Mead spiral bound notebooks in the past, but I finally decided to start exploring better paper options. I found an affordable line of notebooks by Apica and sold by Goulet. They offer a few sizes, but I have some that are 5.83" X 8.27" and some larger ones that are 7.05" X 9.92". They are very affordable for the paper quality and amount of sheets. They aren't perforated, however. I am also trying out a Clairefontaine Basic Clothbound Notebook for journaling. If I want nice paper with a perforated edge (to write a note on, for example) I use a Rhodia No. 16 Notepad. Rhodia paper is my favorite, however I simply can't justify it for everyday note-taking in class. This has been one of the best months of my life, and it's only 14 days in as of writing these words. I've shared bits and pieces of my story, but I wanted to sit down and share deeply about who I am, and how I got to where I am right now. Let me start by rewinding 19 years. In May of 1998, I was a high school dropout. I had been working as a concrete finisher for a couple of years by this point. We lived in an old mobile home in a very small town about 40 miles from my hometown. Going out to McDonald's would have been an expensive, and extravagant outing. My mom became seriously ill, and almost died. Because she wanted to be closer to her family we moved back there. We were then living in an even older mobile home that only partially had working running water, was missing some windows, and leaked like a cardboard box when it rained. At that point, I didn't know what I was going to do with my life. On a whim, I walked into Florence-Darlington Technical College in July of 1998. I asked to speak to a guidance counselor and I told her my story. I'm sad to say I do not remember what this lady's name was, but here is what she did: She went and got a placement test of some sort, and had me take it. Something in me must have impressed her. She rushed me through the financial aid process, and I got a full ride based on need. She told me I could start classes in August, but I had to take and pass the GED at it's next offering in September. I took the GED and passed with flying colors. I continued at FDTC for two semesters, and I transferred into Francis Marion University. I still had a full ride based on a need-based financial aid. Things were going great, until I turned 21. When I turned 21, I discovered alcohol, and it was not good. My grades plummeted, and I dropped out of college in October of 2001. Let me fast-forward to where I was in 2004. Many, if not most days of that time in my life, I can guarantee that I drank copious amounts of alcohol. In June of 2004, I would walk out of a job I had fought to get, with no real experience nor a college degree at a software company that served the faith based community. After I left that job, there were a few months of drinking more heavily than usual. I finally got a job at a national electronics store. After being in that job for about a year, I had a major health crisis. I was out of work for 8 months, and almost died. I won't go into details here, but it wasn't good, other than the fact that as a result of the illness, I stopped drinking. I managed to get myself, and my life back together, somewhat, and I was able to go back to work at that electronics chain. Once I started back, I worked my way up the "corporate ladder" of that store, and I held several different leadership positions. Now, fast forward to the where I was in 2007. You see, I really loved the job and the company I walked out of in 2004. Even though I was being successful at my new job, I continually emailed my former boss. He finally gave me a new interview in 2007, and I was able to start back at my old company, in a better position than the one I walked out of. Let me fast-forward now to where I was in 2012. I was working for that same company that served the faith based community, but I hadn't regularly attended church for years. I had drifted from the zeal for Christ and the church I had in my childhood and youth into some sort of agnostic fog of uncertainty. I was earning a good salary, and I had every reason to be happy, but I wasn't. In May of 2013 I bought a house and moved next door to one of my co-workers. In July of 2013, I went to an event at a church these neighbors invited me to, and I really felt God working in my heart. I knew that I had to get back into church, and I did. At some point in that year, my pastor was out of town and as a guest preacher was the music minister's son-in-law. All I knew about him was that he was in Seminary "up in Wake Forest". I felt a a very strong twinge in my heart when he was introduced. Instantly and completely out of the blue, what popped into my head was "I wish I could go to Seminary." Almost as instantly as I thought that, I was confused as to why I would think that. It's funny to think now, but then, I did not even know that Southeastern Baptist Theological Seminary existed. To me, "up in Wake Forest" meant at Wake Forest University in Winston-Salem (I was at least smart enough to know that WFU was not in Wake Forest). I felt a call to ministry when I was very young. I used to preach to people in waiting rooms, in line at the grocery store...wherever people couldn't get away from me. Everyone thought it was cute then, but it was real. When I was a bit older, about 10 or 11, I felt the call again, and did nothing to act on it. This time, when it came back, it was so real, and it was so insatiable. I hadn't read anything longer than a blog-post in years and I was devouring every theological book I could get my hands on, and most importantly I was devouring the Bible. I did eventually find out that the young man that preached that Sunday did not go to WFU, but to Southeastern Baptist Theological Seminary. By this time I had already researched, heard about, and been recommended to other schools, but I knew without a doubt I was going to Southeastern I had a clear and definite call to come here, and I came. I never came up for a campus tour, a preview day or anything. I applied in June, was accepted in July and I drove to Wake Forest for the very first time on August 8, 2014 and lived in a small room in a house set up as dorms for older, single male students. As I mentioned above, my mom hasn't been in good health for years. She is doing better now than she has in years, but I still did not want her to stay by herself. Plus she has very limited resources, and wouldn't be able to support herself alone. So she's here too, we now live in a campus apartment in family housing, and she's our building's Grandma of sorts. She loves having all the children around. This past Friday, on May 12 was probably the most emotional day I've ever had. Now I don't show emotion much. I guess that's the introvert in me. My emotion usually comes out in writing, or tweeting, but it's been strong. I've never graduated from anything in my life, but on Friday, May 12, 2017, I graduated from college. God can and does work miracles, and the fact I am here is clear evidence of that. I've now got my B.A. and I'm starting on my M.Div. I'm still listening to, and discerning God's call, and His will, but I do know one thing: He wanted me at Southeastern, and I am here, and here I am going to stay. I will gladly tell anyone considering Seminary to come here too if you feel God calling you. This place is special. The leadership and the faculty continue to not only educate, but inspire and encourage me. I still, after three years get excited walking onto campus every day. I love this place, and I know I am where God wants me. I can't wait to see what is ahead, but I know it will be great, because God is great. At our graduation ceremony, Dr. Akin preached from Philippians 1:21: "For to me, to live is Christ and to die is gain. (NASB)." I'm living for Christ now, and I know that when I die, I will gain because I will for eternity be in the presence of Christ. If God is calling you somewhere, to do something, listen. I earn far less of a salary now than I did when I left my old career, but I now know the joy of following God's will for my life. It's amazing. God can, and will do amazing things if we just listen to him and come when he is calling us. I just received a copy of the ESV Study Bible, Personal Size, Natural Leather, Brown. I was curious about this Bible when I first saw it was going to be released, so I was happy to be able to get a review copy to check out. If you have ever seen the ESV Journaling Bible with the "natural" leather and the flap that comes around and ties, that is exactly the kind of leather on this Bible. The leather is nice, but rugged. One quibble I have is that I wish there were a tad more yapp (or overhang) as it seems pretty flush with the text block. Also, I wish the ribbon were about 1/2-3/4" longer. Because of the thickness of the text block, it feels just a tad unbalanced with cover edges that are so tight against the text block. The page edges are plain white with no gold gilting. This is a trade-off as some think the gold gives protection, but in reality it usually just gets scratched up and ugly on Bibles which you might use a lot/throw in your bag, etc. However, on this Bible, the text block is quite thick, and (especially when I first saw it) because if the proportions, the white page edges are a bit 'shocking' (I've tried to think of a better word, but that's all I can do). The thickness makes them look especially white, and if they get dirty, they are going to look especially dirty, I'm afraid. The binding is sewn and lays flat absolutely anywhere. Not one hint of over-tightness (and that's good as this is a fairly thick text block). While this is a smaller footprint than the "full-size" ESV Study Bible, it's still a chunky book, so be aware of that. However, it is very portable and sits in my hand quite nicely (and I don't have overly large hands). If you want a portable copy of the ESV Study Bible you can carry around and will hold up to sustained heavy use, I think this is your ticket. From a durability standpoint I highly recommend this copy, as I think it will stand up very well to heavy, day-to-day usage. From an aesthetic standpoint, that will be more of an issue of if this is within your style or taste. Finally, one last thing to mention, is I discovered in this Bible there is a new edition of the ESV text. This is a 2016 "Permanent Text Edition". You can find more information here, however the gist is that the ESV translation committee has 52 word changes, some minor addition of some quotation marks, and have stated that this will be the ESV text for the foreseeable future. This made me very happy. Finally here are some photos so you can check this Bible out for yourself. *Disclaimer I received my copy gratis from the publisher in exchange for an honest review. The opinions stated above are my own honest opinions and I was not required to give a positive review. Thanks! I usually say this multiple times a day to myself: I love this place! I first set foot on the campus of Southeastern Baptist Theological Seminary on August 8, 2014. It was the day before new student orientation for my semester began. I had never even visited the campus before, but I knew that this was where I was supposed to be. I still can't explain it. When God called me to seminary, he didn't just call me to any seminary, he called me to Southeastern. I love this place! I got choked up the first time I saw the steeple at Binkley chapel. I still get excited as I cross the crosswalk on South Avenue every day as I arrive at campus. I love this place. I'm a higher education re-tread. I had (foolishly) dropped out of college in 2001, and went on into the workforce. I was 34 years old when I attended my first class at the College at Southeastern. The past few days I've been planning my next two semesters out. They'll be my last two semesters as a "College Student" as I will graduate with my B.A. in May of 2017. Two more semesters. Wow. It feels like I just got here. Thankfully, I have plenty more to learn from the faculty here, as I definitely plan to get my Master's of Divinity and hopefully do Doctoral work here as well. There is so much to learn, and I love every minute of it. Oh, and I get to work here too. Isn't it amazing what God can do? It's March right now. It would have been March in 2014 when I would have been spending my lunch-break at work at my old job back in South Carolina taking long walks and praying...talking to God, asking for some way for me to be able to come here. There were times when I wasn't sure I'd be able to do it. I was in my mid-30's. Mid career at a good job in the IT industry working for a good company. Some people thought I was crazy for wanting to do this, but mostly everyone I know has been supportive, and I know I have lots of folks from my church back home, Ebenezer Baptist Church in Florence, SC praying for me. I take school seriously. I work hard, and yet it doesn't feel like work. I love every minute of it. I thank God every day that I get to be here...that I get to learn here, from this faculty. I love this place!